Location applications such as the Maps application handle the ACTION_VIEW intent when supplied with a URI with geographic coordinates. This URI has a special format. If there are applications on the device that handle geo-format URIs, the appropriate application (for example, the Google Maps application) will launch as the new foreground activity and show the location. 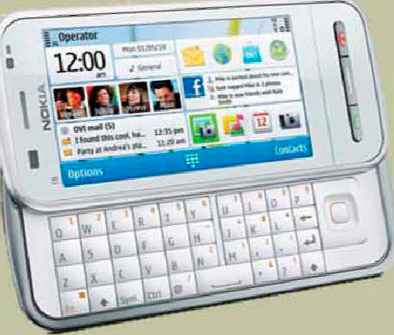 After the user has looked at the map, he or she can return to the calling application by pressing the Back button. By using the Geocoder class and an intent to launch the Google Maps application, you can complete the favorite place picker dialog, including the Map It! Button control, as shown in Figure 14.10. The favorite place picker dialog, launching the Google Maps application. 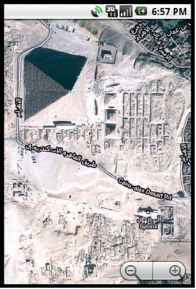 If you press the Menu button in the Maps application, you can change the map mode to satellite and zoom in to see the Great Pyramids, as well as all the tour buses and the Sphinx, as shown in Figure 14.11. 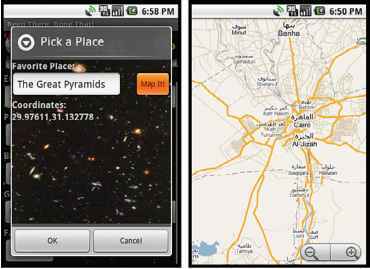 Using the Google Maps application to zoom in satellite view.